Celebrations are in order for everyone involved in the artisan garden ‘Viking Cruises Garden of Inspiration‘ designed by Sarah Eberle. The garden was awarded the highly prestigious and sought after Gold Medal by the Royal Horticultural Society. RHS award the medals each year for the Chelsea Flower Show 2017, according to strict judging criteria. Sarah’s Mediterranean styled design features a curving mosaic wall at it’s centre, designed, made and installed by Gary Drostle. The mosaic was made from the finest mosaic material, Venetian Smalti Piastrina, the same hand made glass Gary recently used to restore the mosaics at Tottenham Court Road tube station. The design for the mosaic was inspired by the famous Gaudi benches at Parc Güell in Barcelona. Gary arrived at the design by going back to the classic spanish tile designs and re-assembling the broken designs into a new organic form. Unlike the mosaic in Parc Güell here Gary created the ‘broken’ patterns at a larger scale. Gary created them from hand made glass enamel, bringing a contemporary view. The mosaic wall was further integrated into the hard landscape design by adding a subdued mosaic top to the second wall. A reflection of the glass mosaic was created in the water rill feature running along two sides of the garden (also created by Gary). 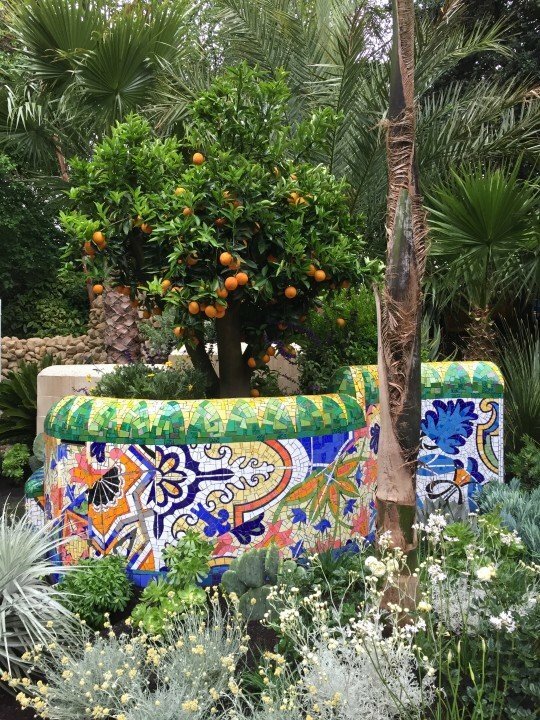 Around these central features Sarah expertly planted the palms, orange tree and drought resistant mediterranean plants to fully integrate the mosaic in the garden. Sarah Eberle, remains Chelsea’s most decorated designer with a total of 14 gold medals at the show. This year she celebrates the ‘treble double’; three years in a row of two golds for her gardens. 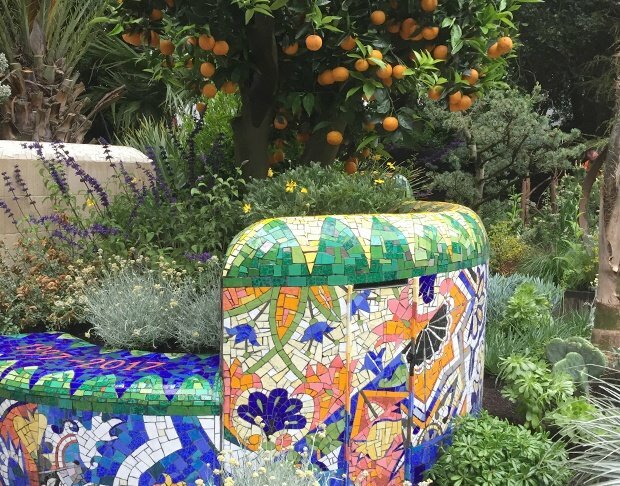 The garden was sponsored by Viking Cruises on the theme of Barcelona one of it’s destination ports.